Every dyed-in-the-wool Doctor Who aficionado needs a set of napkins that proclaim their fandom when guests come over for dinner. Hence, the Doctor Who TARDIS Anthony Dry Napkin Set. 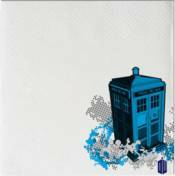 Themed to the Doctor's famed time machine, these napkins should definitely fit the bill! Each set has 20 paper napkins.